There are unexpected interactions between elements of your home security system, with bad consequences. Would you catch them? There are important lessons here for designing IoT systems and their interfaces. By now, you will have designed analogue, digital, and conversational microwave interfaces, and hopefully abstracted some reusable design approaches. Here is our response to the UX Puzzle for the Brainy, about smart digital microwave interfaces. The original puzzle statement with answer pointers can be found here. These puzzles show how, by taking the user’s point of view, we can generate ideas and select the best ones, innovate, avoid pitfalls, and generally make better thought-out user experiences. They are a fun way of presenting serious ideas about designing information rich solutions. Make sure you don’t miss any by subscribing to our feed. For a more serious and systematic information about user experience design and arcitecture, see “Experiencing + Architecting Information” at www.theinformationartichoke.com. Here is our response to the UX Puzzle for the Brainy, a microwave makeover. The original puzzle statement with answer pointers can be found here. This week’s puzzle, Microwave Makeover, is ready. Your challenge this week is a simple usability makeover. The takeaway is how to do this sort of thing in your sleep. Our response will follow in a few days. These puzzles are a recreational way to improve your product design chops. Once a week, you will be given a small UX challenge, with pointers on how to approach it. A few days later, we will publish our response to the challenge. There is no such thing as the “right answer”, just more or less well-thought-out answers. If you disagree with our response, excellent. We are all participants in a design activity, with different points of view for generating and evaluating ideas. You may be experienced or a newbie. You may be a product manager, business analyst, information architect, user experience architect, or visual designer. You want to grow your skills and make sure that your contribution is relevant and well thought-out from a user point of view. We focus on structure and function. We consider users’ goals, strategies and knowledge to get the right foundations and shape for the solution. We do not cover visual treatment, typography, or copy. These puzzles are in the spirit of the series Experiencing + Architecting Information. This will give you a good idea of our level and approach. UXers design information products to meet user needs, but they typically don’t understand information as well as users. This slideshow explains that there information-centered practices and processes complement user-centered design approaches and gives some examples. Good grief – not ANOTHER three circle Venn diagram! I can’t be the only one who cringes when they see another three circle Venn diagram. You know the thing: overlapping circles for User, Business, and Information, or for Strength , Cardio, and Flexibility. Why not just say “there are three important considerations, User, Business, and Information, and they are interrelated”? But no, we feel obliged to use a Venn diagram. Does this kind of diagram really tell us anything more? Does the overlap of User, Business and Information mean some kind of “sweet spot” where everyone is delighted? If so, it doesn’t say much for the other areas. And are there really any cases where Information is not informed by User considerations? And so on. I have long respected a cartoon demonstrating “Be simple but not too simple”. I wish I could find the source to give it credit, as it has been a mental companion for many years. “Being simple” was illustrated by a diaper fastened with a safety pin. “Being too simple” was illustrated by a diaper fastened with a straight pin. Hahaha. Being too simple is wrong. The three circle Venn diagrams I am complaining about are wrong. What is the universe? For a good Venn diagram, a universe is implied and then subsetted by the circles. The universe of Warm Blooded Creatures has subsets Featherless and Bipeds (we live in the intersection). What is the universe for User, Business and Information? Hard to say, but something very abstract like The Space of All Considerations In Solutions Design. And why three circles? Because three is easy. Venn and others wanted to extend Venn diagrams to more sets and the Wikipedia entry for Venn diagrams shows elegant and complex extensions. Fascinating, but they would be really scary in a blog post or book. So yes, I personally cringe. 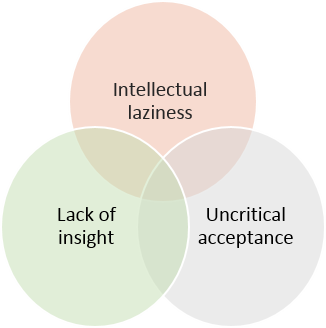 I am not sure whether it is because I mainly dislike the Intellectual Laziness, the Lack of Insight Provided, or the Uncritical Acceptance of This Diagram. Perhaps I should draw a Venn diagram to help me!